As of today, Marquette's Pomeroy offensive and defensive rank are #14 and #60, respectively. I wanted to dust off the blogging keyboard to ask a question... what are the offensive and defensive profiles of teams that advance in the NCAA tourney? I've been collecting this information for a few years and have NCAA data from 2007-2012. First, here are the averages. The numbers are consistent for both offense and defense. 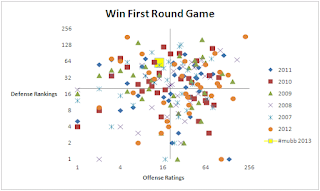 On average, the requirements for a first round win start at a top 35 ranking, move to a top 25 ranking for the Sweet Sixteen, and then become top 20/top 15 for Elite Eight and Final Four. Marquette is below the average requirement defensively but has an elite offense. How does the breakdown look at the different levels when considering both offense and defense? This chart is not very helpful. Just note that the x axis is the offensive ranking, the y axis is the defensive ranking, and that it's a logarithmic chart (base 2). 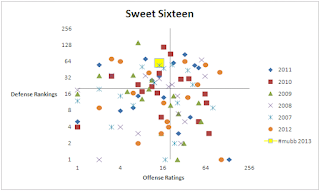 Marquette 2013 is the yellow box in the upper left quadrant (top 20 offense / below average defense). Just note that there are lots of teams that win their first round game at all levels of offensive and defensive efficiency. It's almost a kind of madness. 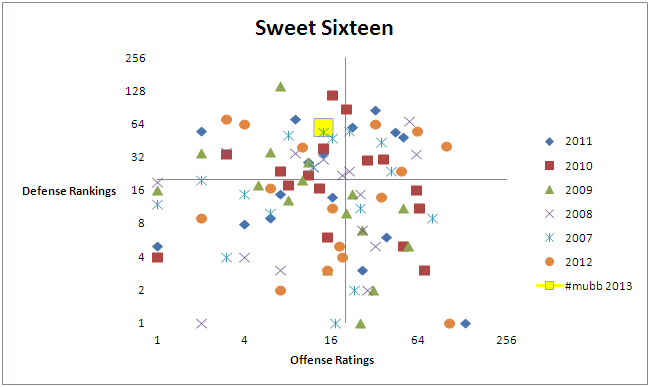 The important point on the Sweet Sixteen chart is that the number of teams with sub-top 20 offense and sub-top 20 defense has dwindled dramatically. Marquette still fits comfortably in the quadrant. 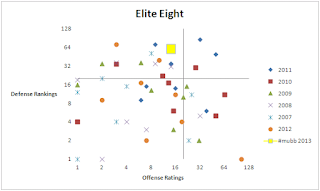 The Elite Eight Chart is where the differences really stand out. 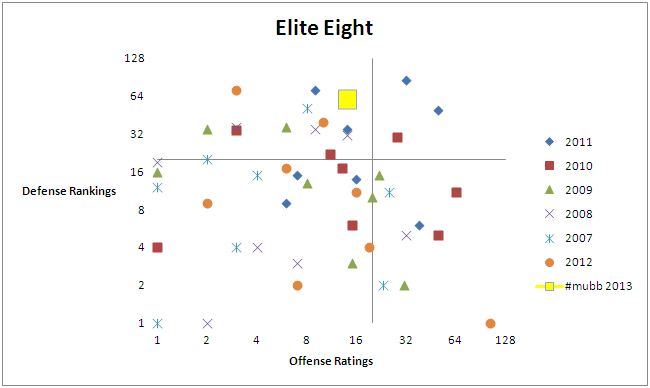 Half the Elite Eight teams have both a top 20 offense and a top 20 defense. There's a slight advantage for offensive-minded teams here, but it's pretty small. 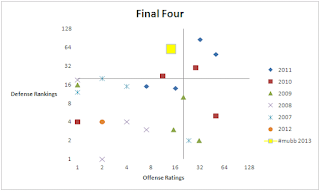 It is worth noting that half the teams making it to the Elite Eight do so with a very strong offense OR defense. There's the Final Four profile going back to 2007. It's much more unlikely to make it without a top 20 offense and top 20 defense. 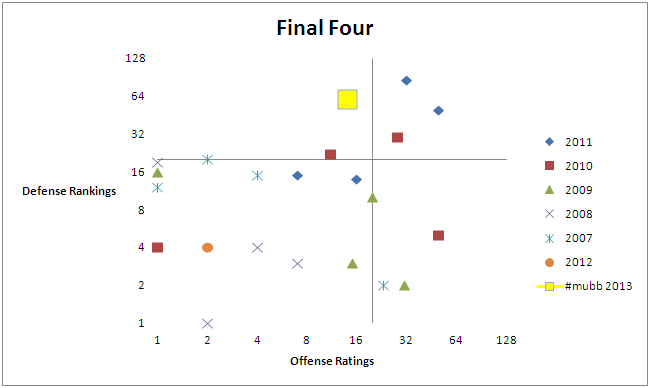 Note that the only three teams with sub-par offense and defensive profiles are Michigan State, Butler, and VCU. Or, the greatest tournament coach in history and two goofy Final Four runs.